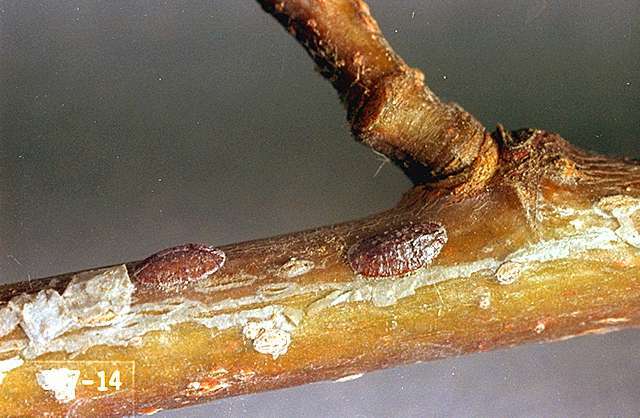 Pest description and crop damage This scale overwinters on grape canes as an immature brownish to black scale of about 0.06 to 0.14 inch long and has a flat and oval outline. Scales attain a maximum length of about 0.25 inch during spring. The conspicuous, cottony egg sac of the mature form is two to three times the length of the scale body. The insect feeds on foliage, reduces the vigor of the plant, and causes twig dieback. Feeding scales produce honeydew, which becomes a food source for ants and a substrate for sooty mold. Scout for noticeable presence of ants, as this may be the first sign that the scale is present on a vine. Biology and life history Each female lays about 3,000 eggs. The egg sac remains for some time after the female has died and crawlers have dispersed to the undersides of leaves. Scales reach maturity in June, and crawlers appear in July and August. This pest has not been common in Oregon vineyards. Caution is to be taken with scale insects as they may vector certain grapevine viruses, such as grapevine leafroll virus. Although biological controls of cottony maple scale have not been studied, scale insects generally are preyed upon heavily by parasitic wasps. Since much of the vine is removed at pruning, it may be unnecessary to apply control measures unless the scale is infesting the main trunk or cordons. horticultural oils-Some formulations are OMRI-listed for organic use. Scale insects can be difficult to control with contact insecticides because of their cryptic behavior. They are often found within crevices and under the bark. During the latter portion of the growing season, they can be found within clusters. All of these locations are difficult to reach when applying contact insecticides. Often, contact insecticides are the only viable option to control these insects. When using contact insecticides, make sure to get thorough coverage of the target (trunk or clusters). Systemic insecticides may be more effective because the insect is targeted at the feeding site because of uptake and systemic movement of the insecticide. However, be aware of the disadvantages associated with the use of systemic insecticides, such as effects on non-target insects. buprofezin (Applaud) at 0.53 lb ai/a. PHI 7 days. Do not exceed 1.05 lb ai/a per season. Allow at least 14 days between applications. Apply by ground using 50 to 200 gal/a water, depending on the size of the grape plants. Use higher water volume to ensure better coverage, especially under hot, dry weather and/or a dense canopy. Do not exceed two applications per season. 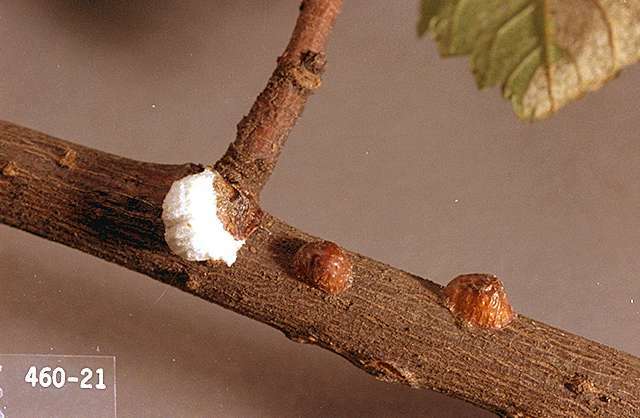 Although cottony grape scale insect is not listed on the label for grapes, it is an effective and legal use. Group 16 insecticide. horticultural oil (several brands)-Consult label for rate. Apply oil at a spray volume of 200 to 300 gal/a. Apply in late March or early April while vines are still dormant; do not apply oil after budbreak. Some formulations are OMRI-listed for organic use. spirotetramat (Movento) at 0.10 to 0.13 lb ai/a. PHI 7 days. Ensure that there is adequate foliage for absorption of the compound. Allow 30 days between applications. Do not exceed 0.2 lb ai/a per season. Use a high quality spreader to enhance penetration into foliage; see label for more details on which adjuvants to use or avoid. Group 23 insecticide. Soil application at 0.25 to 0.5 lb ai/a. PHI 30 days. Apply in one or two drip irrigations between budbreak and pea size stage of berry development. Consult label for restrictions. Do not apply more than 0.5 lb ai/a per year. Group 4A insecticide. Foliar application at 0.036 to 0.05 lb ai/a. PHI 0 days. Although scale insect is not listed under foliar applications for grape, it is a legal use and should be helpful in controlling scale crawlers. Do not exceed 0.1 lb ai/a per year. Allow 14 days between applications. Group 4A insecticide.